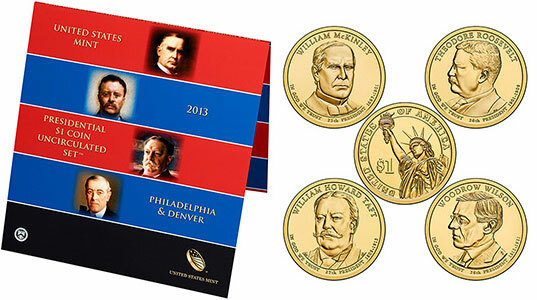 The United States Mint has started accepting orders for the 2013 Presidential $1 Coin Uncirculated Set. This numismatic product includes uncirculated versions of the four latest Presidential Dollars. This year the series honors the 25th to 28th Presidents of the United States. Separate coins are issued carrying the portraits of William McKinley, Theodore Roosevelt, William Howard Taft, and Woodrow Wilson. The obverse inscriptions indicate each President’s name, the order of the Presidency, the years of the term, and the motto “In God We Trust”. The reverse design of each coin contains a common design depicting the Statue of Liberty with inscriptions “United States of America” and the denomination expressed as “$1”. Each coin carries incused edge lettering with the date, mint mark, and motto “E Pluribus Unum”. The original authorizing legislation for the program specified the use of edge lettering to allow more room on the coin for dramatic artwork. The 2013 Presidential $1 Coin Uncirculated Set includes uncirculated examples of each of the four coins struck at the Philadelphia and Denver Mint. These coins are mounted within a folder containing a brief biographical sketch of each President. Each set is priced at $16.95 with no stated product limit or household ordering limits. Throughout the year, the United States Mint will offer each of the four 2013 Presidential Dollars in bags, rolls, and boxes of circulating quality coins. The products for William McKinley have already been released.